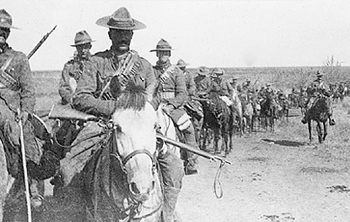 The 2nd Regiment, Canadian Mounted Rifles on patrol in South Africa, February – March 1902. Note the rather bedraggled appearance of some of the Stetsons, the Orndorff bandoliers, and Mark 1 Lee-Enfield rifles. In early 1901, the Canadian government offered to raise a third contingent for service in South Africa, but the British replied that there was no need. In November 1901, however, the British government requested a four-squadron regiment of mounted rifles. In a departure from previous practice, the unit was recruited as an integral part of the British Army, though retaining its Canadian identity. Moreover, while the Canadian Department of Militia and Defence would equip and train the unit, the British would pay its costs. The response from the public was so enthusiastic that Ottawa, realizing there was surplus space on the troopships, offered to raise another two squadrons. When the unit finally sailed from Canada in January 1902 it was a six-squadron regiment of 901 officers and men. Together with the 10th Canadian Field Hospital, it formed the third Canadian contingent. Appointed to command the new unit was Lieutenant-Colonel T.D.B. Evans, who had earlier earned a reputation as the best Canadian leader of mounted troops while in command of the Canadian Mounted Rifles in the second contingent. The majority of the officers and at least a quarter of the men had previously served in South Africa. After a number of weeks training at Newcastle in Natal, the unit was ready for action and moved by rail to Klerksdorp, southwest of Johannesburg. By this time, the nature of the war had changed dramatically. The Boer forces were reduced in numbers to less than 25,000 in the field. The countryside had been largely cleared of inhabitants, who had been confined in concentration camps. Moreover, the free movement of the mounted Boer commandos was greatly restricted by long lines of blockhouses, linked by barbed wire, that snaked across the veldt and followed railways and river lines. The British had 150,000 men in the field, with nearly half manning the blockhouse lines and garrisoning towns. The bulk of the remainder were mounted, pursuing Boers across the veldt. There were still gaps in the network of blockhouses, including the arid western Transvaal (See map), where the British sent the regiment. The mounted rifles participated in a number of major drives that resulted in the destruction of at least twenty percent of the Boer forces in the western Transvaal, most of these being captured. It was not all one sided, however. On 31 March the unit fought as part of an outnumbered British force at the Battle of Harts River, or Boschbult. Casualties were heavy, including 13 Canadians killed, 40 wounded, and seven missing. With the exception of the first engagement at Paardeberg on 18 February 1900, Harts River was the bloodiest day of the war for Canada. The unit participated in a number of other drives to round up Boers before the war ended on 31 May 1902. It returned to Canada at the end of June. While its tour of operations had not been long, the 2nd Regiment, Canadian Mounted Rifles had proven to be a worthy successor to the units of the first and second contingents.